Which is not the unequivocal conclusion Mr Alcock presents to us. Unexpectedly, he mocks the professor’s statement by correctly defining lack of warming: “because each year since 1998 has not got progressively warmer.” He implies disdain that Professor de Freitas should say that global warming has been absent only because there has been no global warming. When what’s actually happening defies one’s fond belief it must be hard to accept. Oh, good science, Professor Gluckman. Seventeen years is a gigantic short term. How do you know the warming will return (are you psychic?). Since it was warming for only about 20 years from about 1980, that’s an amazingly short long-term trend, wouldn’t you say? So the hiatus in warming is openly recognised in high places around the world, and it’s quite put the cat among the pigeons as people try to explain it without destroying the CAGW hypothesis. The hiatus cannot be nullified, as Mr Alcock intends, by simply denying its existence. He refers to a strong El Nino and cooling La Nina events merely to distract us — note that he utterly fails to deny the lack of warming. When he says 11 of the last 13 years were the warmest on record he makes the empty insinuation that therefore it warmed over the period. But it could well have been cooling and still be true. Oh, wait, it was cooling. The claimed “records” were by virtue of only a few hundredths of a degree and were to all intents and purposes identical. If temperatures are to reach the range suggested in the AR5 (2013), after failing to rise for 17 years (over half the conventional period of 30 years), they’d better get a hurry on! Temperatures must now rise at an impossibly steep rate for the predictions of strong warming still to come true. On sea level, Mr Alcock says: “The longest reliable tide gauge records in the south Pacific go back only to 1992. But the trends at the 11 island gauges range from about 3mm to 8mm a year, faster than the long-term global rate.” He seems not to know that New Zealand, also situated in the South Pacific, has reliable tide gauge records going back to the 19th century, some of the longest in the world. It is important to stress that as the sea level record becomes longer, the short-term trend estimate becomes more stable and reliable. Observed trends in sea level include natural variability, for example, events such as El Niño and effects due to many other atmospheric, oceanographic and geological processes. Longer-term data sets for all stations are required in order to separate the effects of the different signals. Please exercise caution in interpreting the short-term trends in the table below – they will almost certainly change over the coming years as the data set increases in length. Mr Alcock creates a straw-man argument by referring to a recent drop in sea level, which the professor didn’t mention. We can be sure that when Professor de Freitas says Pacific sea level rise is almost undetectable he has observations to back it up but our fearless Mr Alcock doesn’t bother to inquire. He castigates Chris de Freitas for drawing firm conclusions from short periods (which he doesn’t actually do), so when he himself claims that Pacific sea levels are rising faster than the global rate — citing records that he acknowledges go back “only to 1992” (20 years) — he exhibits a quite breathtaking hypocrisy. All his arguments fail. What a waste of time. LOL – that is a haiku-type ending to a perfect discombobulation of vacuous hand-waving. Thanks RT. I hope the Herald publishes it. Your mocking of Prof Gluckman comes across as very odd as he doesn’t even feature in the article. He is not pyschic but he does understand the science and how contrarians pick start-points to coincide with major ENSO events. When I watched the IPCC “out reach” session from Wellington recently, everyone there acknowledged “the pause” and there was no mention of cherry picking or El Nino events. How do you know he “understands” that Simon (it’s problematic – see below)? Does he “understand” how the IPCC picked an end point (2010) of their attribution period to coincide with a major ENSO event (El Nino) for their 2013 assessment report?. Or how the CO2-centric climate scientists perennially truncate their series short for best effect e.g Balmaseda et al (2013) ended at 2009 even though there was up-to-date data available to at least 2012, and they didn’t do a basin-by-basin analysis to boot. Does he “understand” that? You’ve got a gall Simon, and I could elaborate more but a question in regard to your statement instead. What examples (note my plural) do you have of “contrarians” who “pick start-points to coincide with major ENSO events” (note your plural) given the 1998 El Nino was 15 years ago and Santer’s criteria is at least 17 years? Can’t see WUWT being a culprit as Gluckman “understands”, in fact, only the superseded HadCRUT3 reference comes close to a start-point coinciding with a major ENSO event. Are the culprits elsewhere Simon (i.e. put up or shut up)? GISS? Whoop-de-doo. 1951-1980 was the low of the PDO cycle and their post-adjustment “adjustments” are legendary e.g. More pronounced than GISS, HadCRUT has the 1940-1950 decade warmer than 1951-1980 so what are those 3 decades representative of exactly? The coolest 30 years they could find? Nothing yet from HadCRUT so a “warmest ever” pronouncement seems a little premature to me (unless of course, we have to “pick” GISS exclusively). Really though, aren’t you just indulging in a bit of “picking” yourself Simon. Obviously these are statistical coincidences given the range of trends in each category and not overtly “picked”. So far, looks like emotion might have crept in to the “climate realists” betting. They found ONE run, from ONE model, from the superseded CMIP3 – why not “state-of-the-art” CMIP5? And where’s the historical observations comparison? Then how about (from up-thread)? Then they had better learn – pronto (their MRI model that managed a pause didn’t know either – what caused that pause then? ), because that’s how it will be for 60 years or so i.e. just one weak 11 yr solar cycle does not make a significant (in century scale terms), and the effects of “deep solar minimum” (as Rahmstorf puts it). The effects of 2005-2010 wont be fully observed until at least 2010-2020 due to thermal lag and the SC24 peak right now in 2013 is the weakest in 100 yrs, we wont know all about the effect of that until after 2013. Rahmstorf”s in for a shock when (as predicted) there’s about 5 weak 11 yr cycles in a row if he hasn’t thought about it (as every solar specialist has) and he discovers what a deep solar BICENTENNIAL minimum is. CO2-centric solar specialist Mike Lockwood has recently raised his probability of an 1800s Dalton-style minimum from 5% to 30%. Rahmstorf might consider what the temperature was at that time in the 3 graphs he’s posted. Clueless – but predictable spin. “i.e. just one weak 11 yr solar cycle minimum does not make [a significant difference in century scale terms], and [the full effects of SC23] “deep solar minimum” (as Rahmstorf puts it) [wont be observed for at least a dozen years after it]. In your dreams Stefan. What causality EXACTLY, did the SINGLE MRI model run (not “models”) “explain”? This model has probably been run in the same configuration a number of times. How many times does it exhibit an early 21st century hiatus in that configuration? I’m guessing once if the UKMO’s decadal forecast is anything to go by. 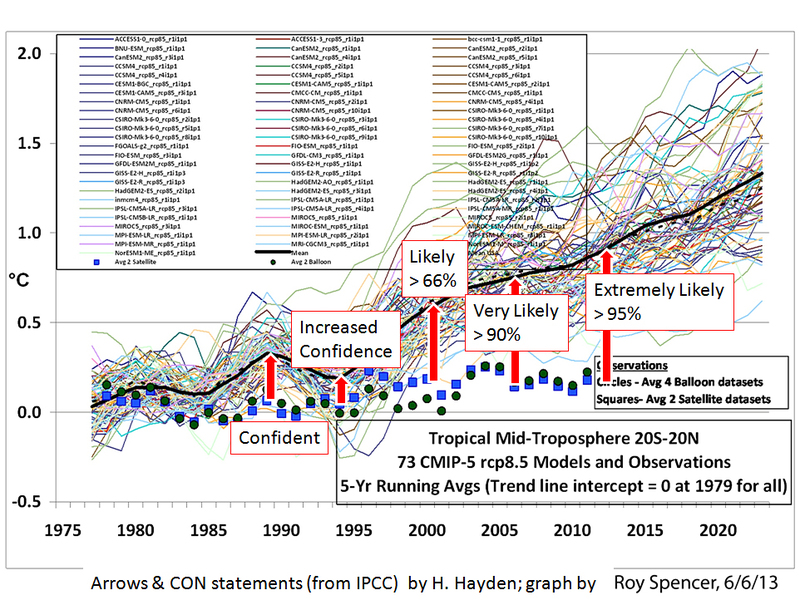 Figure 1:………………..The blue lines show the evolution of the 10 individual forecasts which constitute the ensemble. Didn’t mimic 1865 – 1905 (40 yrs) or 1920 – 1970 (50 yrs) i.e. 90 out of 150 yrs were out of whack. Other than that, it did quite well. Most excellent droning about “deniers” by some ecofacist cretin. “Run 5” tells us there’s at least 4 other runs – what did all the other 4(+?) runs exhibit? But more to the point, according to Run 5 (assuming the Run 5 “hiatus” is anything other than wishful thinking on the part of Rahmstorf), from the low at about now in 2013 there will be a huge 0.8 C spike up to 2015. Why? Run 5 has a 0.5 C spike 1994 – 1995 but no 0.8 C 1998 El Nino spike. 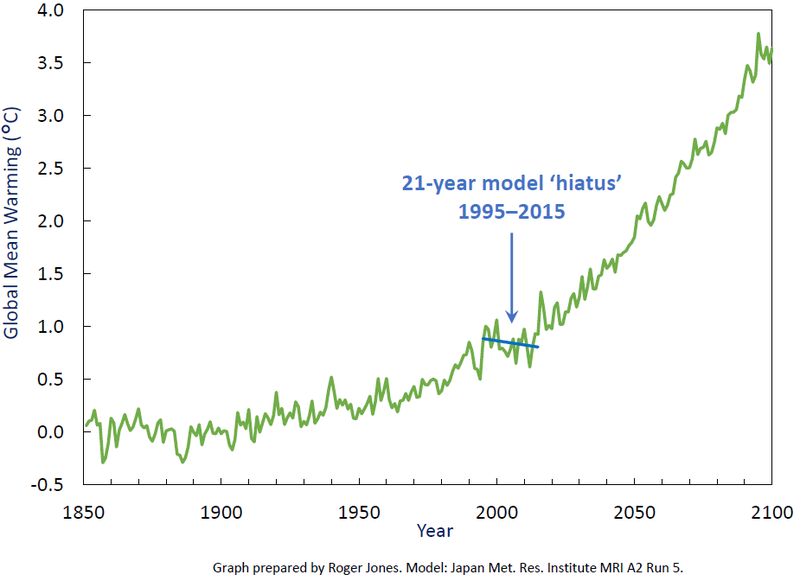 In other words, the start of Rahmstorf’s “21-year model ‘hiatus’ 1995 – 2015” has no real-world validity. Neither is the end of the Run 5 “hiatus” realistic. We are currently in ENSO-neutral conditions, slightly negative, but the temperature is not abnormally cool relative to the decade prior (see HadCRUT4 above). In fact it’s right on the average. But if for arguments sake we take the current low as 0.3 on the HadCRUT4 anomaly, a 0.8 C spike still goes off the chart by 0,2 C.
So not only are the likes of Rahmstorf, Hansen and Renowden, i.e. the alarmist mindset, desperately wishing for a REALLY strong El Nino to get warming back on (CO2-forced model) track in the current negative PDO/La Nina-dominant regime, this particular model run has mimiced their unrealistic wishfulness. This appears to be a triumph of modeling – a model run that mimics EXACTLY the wishful thinking of warming alarmists over the specific and very short future 2013 – 2015 timeframe. It must be some sort of man-machine tele-connection. In reality though, the chances of a 0.8 C spike over the next 2 years are vanishingly small given current levels – even in the unlikely event of a massive El Nino. The peak of the Run 5 spike looks more like 2016 than 2015 on second look i.e. 0.8 C rise 2013 – 2016, but the argument remains the same. The RealClimate post by Stefan Rahmstorf up-thread has it’s roots in the Potsdam Institute for Climate Impact Research (PIK) i.e. by now, this association should be tantamount to need-we-say-more-? Stefan Rahmstorf is one of those “prophets“. Lüdecke and Puls of EIKE then remind readers that such threat was seen already once early in the 20th century. In 2003 the Potsdam Institute for Climate Impact Research (PIK) led a smear campaign against Slovakian geoscientist Jan Veizer and Israeli astrophysicist Nir Shaviv. Both are renowned scientists and have won many awards. In July 2003 Veizer and Shaviv published a ground-breaking paper on the climate impacts from the Earth’s orbit through the galaxy titled: ”Celestial Driver of Phanerozoic Climate?”. The climb-down to near yellow journalism by the PIK’s press action had absolutely nothing to do with scientific etiquette and debate. Of the PIK press release signatories, many are known to readers as Germans and Swiss AGW activists and are still preaching ‘end-of-the-world’ by CO2. 1. Does anyone know of any other plans to respond to this paper? 2. Would anyone like to be part of writing a response? 3. Do you know people who may have the right expertise? Then please forward them this mail. Once Rahmstorf took his hounding and bullying of a non-conforming journalists too far when he wrote an unflattering piece about a journalist in attempt to discredit her. Eventually a court in Cologne found in favor of the journalist, ruling that Rahmstorf had maliciously spread falsehoods about the journalist, even suggesting that she had once plagarized. The court ruled in favor of the journalist and Rahmstorf was fined. Thank God for that. Let’s hope it stays that way. Global water scarcity already on the rise due to exploding global populations may be amplified by up to 40 per cent due to climate change. Research carried out by the German-based Potsdam Institute for Climate Impact Research has found significantly more people throughout the world will struggle to find the water needed for the basics of life as the planet warms. Modelling for the study suggested the spread of water scarcity could be intensified by 40 per cent across the planet as a result of global warming, and in some scenarios could be more than 100 per cent. As a result the institute projects that between five and 20 per cent of the world’s population may face “absolute” water scarcity as the climate changes. How far water scarcity will extend will depend on the rate of population growth and warming. The findings are the result of a comprehensive study, produced in collaboration with research groups around the world, using 11 hydrological models driven by five climate models. Gore also supports the Reddit ban on “deniers” and wonders why all news sources don’t follow suit. The submission by Nic Lewis is particularly good, and explains the problems with the climate sensitivity issue in a very succinct manner. Too long and so not a hope of being published. Newspapers really don’t care. All they want is readible material in reasonably packaged quantities to fill up the spaces between the advertising. You’re quite right, Ian, though the version I sent the Herald was a lot shorter. Trying for two birds with one stone — a blog post plus a letter! Cheers.